Hard Rock Cafe is a popular American chain restaurant that has established strong branding presence especially in Asia. The Penang outlet is located at Hard Rock Hotel in Batu Ferringhi. Parading a rock and roll theme, Hard Rock Cafe is known for American favorites that had withstood the test of time. Since my previous visit, the restaurant has hosted a new batch of memorabilia. These priceless artifacts were collected over the course of more than 4 decades through donations by celebrities themselves. Suspended above the performance stage is a fancy chandelier made from optical fibers. The World Burger Tour is Hard Rock Cafe's annual tradition and is held simultaneously at all restaurants worldwide. Each outlet features several favorite recipes from around the world. For this outlet, Chef Awie has handpicked 8 burgers that resonate well with the local palate. From May to June 2017, the restaurant will feature 4 burgers each month. Riviera Burger (RM65.00) is the main highlight for the month of May. This burger hails from the French city of Nice, located on the Mediterranean coast near the Italian border. The beef patty packs 8 ounces of genuine ground beef, which can be substituted for chicken breast (at no extra cost) should customers request so. Also included are rösti (similar to hash browns), tapenade, arugula (rocket salad), tomatoes and feta cheese (made from sheep's milk). The When In Rome Burger (RM65.00) requires that you dine like the Romans do. Accompanying the beef patty are two slices of turkey bacon, ricotta cheese, sun-dried tomatoes and arugula. The original recipe calls for pancetta, but turkey is used in its place as this restaurant does not serve pork. Garlic aioli is the choice of dressing. Back by popular demand, the El Toro Burger (RM65.00) is a signature masterpiece from Barcelona. Romesco sauce, made from red bell peppers and nuts, helps to balance out today's meat-centric meal. Also included are roasted vegetables, arugula and feta cheese. Native to the Mediterranean, arugula carries a subtle level of bitterness that complements well with Romesco sauce. By the way, the Spanish word "el toro" refers to the bull. Originating in Buenos Aires, Tango Salsa Burger (RM65.00) is dressed with salsa criolla, an Argentine cold sauce made from onions, tomatoes and red bell peppers. Andouille sausage is used in the original recipe, but beef salami fills in as a pork-free alternative. This burger also includes a fried egg, arugula and Monterey Jack cheese. Colombian Plantain Burger (RM65.00) makes its debut in June 2017. The spotlight is cast on plantain, a special cultivar of bananas that are ideal for cooking. Meanwhile, molasses serve to keep the burger moist. Other contributors to the overall taste are caramelized onions, bacon and Monterey Jack cheese. Banh Mi Burger (RM65.00) is the only Asian-style burger for this year's line-up. Inspired by the local fare in Ho Chi Minh City, this burger uses sweet-tangy Vietnamese sauce called nước chắm. Unlike its cousins, the Banh Mi Burger feels juicier thanks to the presence of cucumber, carrot, scallion and coriander. By the way, the word "bánh mì" is a general Vietnamese term for "bread", or "baguette" in particular. Memphis, Tennessee is the home to the finest barbecues in America. Therefore, it is no surprise that the Tennessee BBQ Burger (RM65.00) makes the cut. The patty is seasoned with signature Memphis dry rub of salt and spices. Pulled lamb, another signature delicacy from the birthplace of rock and roll, also makes a dramatic appearance. The lamb is cooked at low temperature for extended duration so that it is tender enough to be "pulled". Acting as counterbalance to meats are pickled gherkins, crispy onions and cheddar cheese. English Breakfast Burger (RM65.00) also makes an anticipated comeback from last year, feeding the most devoted carnivores that have ever roamed the face of this planet. In addition to beef patty, this burger also features a 4-ounce breakfast sausage in patty form. In addition, I also appreciate the lovely juiciness of portobello mushrooms. This enormous burger also includes popular items in typical English breakfast meals, namely ham, fried egg, tomatoes and baked beans. For a mere RM5.00, diners may enjoy an extra side of Artisan Fries to go with any burger of their choice. There are two types of fries: Garlic Fries and Spice Curry Fries. I feel that the former is more attuned to my palate. In addition to food, several signature cocktails from the bar are also featured in the World Burger Tour. These drinks are specially handpicked as they go particularly well with burgers. One example is Electric Blues (RM49.00), an electrifying drink mixed from vodka, rum, gin, sour mix and carbonated water. Blue Curaçao liqueur lends its distinctive blue hue. The drink is served in Hard Rock's Mason jar, which can be purchased from the Rock Shop for RM55.00. Mojito (RM47.00) is a traditional Cuban highball that is concocted from lime juice, mint leaves and syrup. The mixture is gently mashed using a muddler, which allows the mint to release fragrant oils. Rum is then added, followed by soda water and crushed ice. Mojito is presented in a pint glass, which is also available for sale for RM62.00. 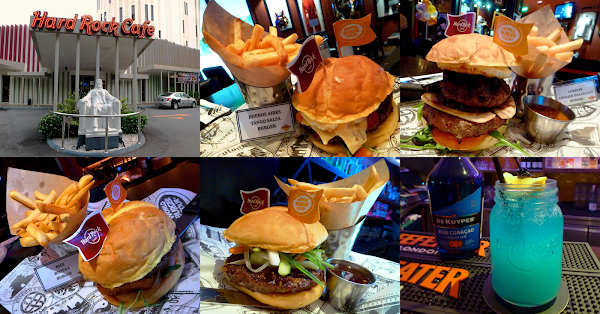 The World Burger Tour is held for a limited time because Hard Rock Cafe has a series of menus throughout the year. Like the main food menu, the burgers are served from 11:30am till 10:30pm. Customers who are here for entertainment will be pleased to know that the resident band performs from around 10:30pm on every night - except on Tuesdays during which a local band fills in.